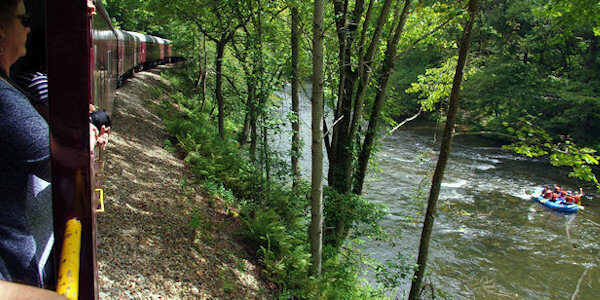 The Great Smoky Mountains Railroad offers scenic train excursions through the North Carolina mountains along Nantahala and Tuckasegee Rivers, across valleys and through tunnels. 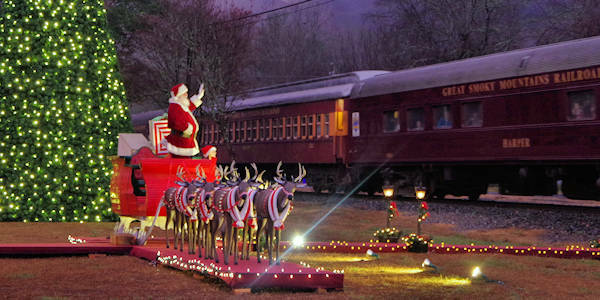 All of the train rides depart from the depot in downtown Bryson City (near Cherokee). Their variety of trips and special event trains (like the Polar Express - read more) are perfect for making memories! Ride in vintage open air cars, climate-controlled cars or first-class with dining options. Ride along the rushing Nantahala River. 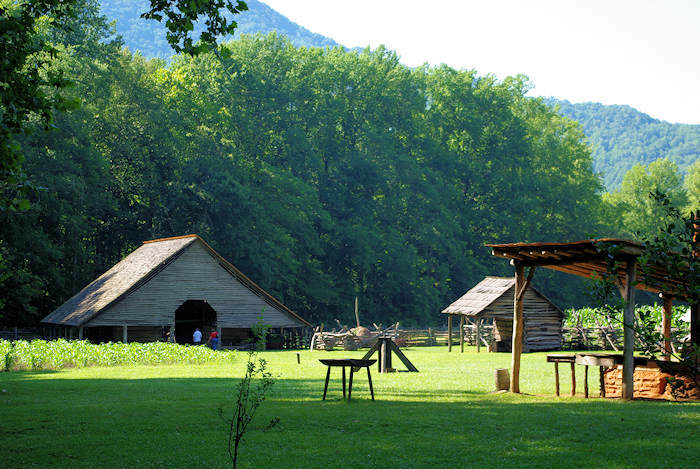 This 4.5-hour excursion carries you 44 miles to the Nantahala Gorge and back. The historic Trellis Bridge takes you across Fontana Lake. 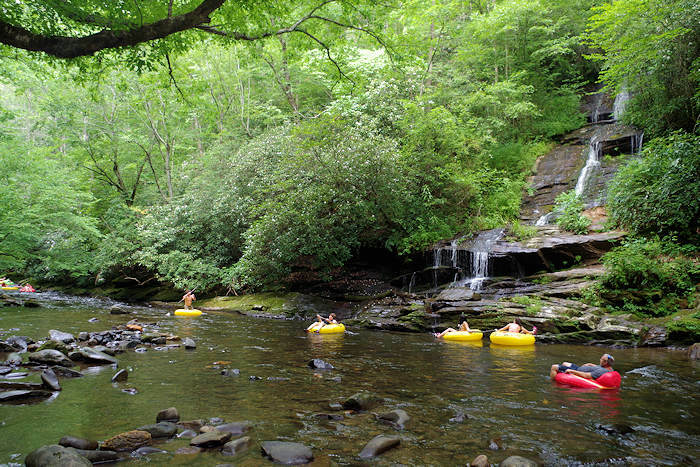 Arrive at the Nantahala Outdoor Center (NOC) for a one-hour layover on the river. Tickets Adults 13+ are $51-$96 depending on seat class, children 2-12 start at $29. 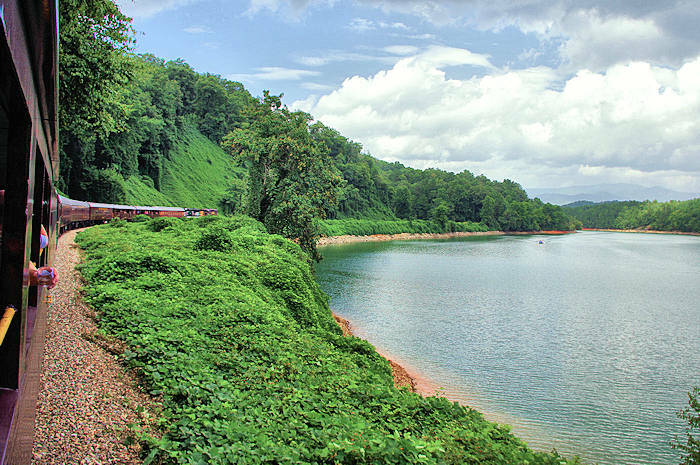 Also check out rafting combo packages - ride the train up the river, then raft down! Ride through quiet countryside in Jackson County. 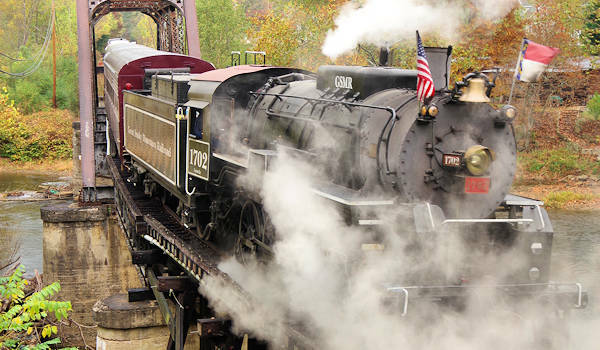 This four hour excursion travels 32 miles round-trip to Dillsboro and back to Bryson City. Pass by the infamous movie set of The Fugitive, starring Harrison Ford, and stop in Dillsboro for a 1.5-hour layover to explore the charming town with an impressive collection of galleries. Tickets adults 13+ are $51-$97 depending on seat class, children 2-12 start at $29. Click here to visit their website for current ticket pricing, packages and specials. After a two-year restoration of 1923 Engine #1702, you can book a steam excursion many dates throughout the year, usually May-October. Before and after the ride, get a close-up look at this remarkable locomotive and watch a demonstration of the turntable near the depot. Click here to visit their website for steam dates and ticket pricing. Most excursions have a full-service concession car with snacks, lunch items and beverages (including alcoholic drinks) for purchase. Or you can pick up snacks or lunch at their cafe in the Depot before your ride. First-class includes a meal. Standard Seating (Coach Class) is in restored vintage coaches that feature windows that open for fresh-air viewing, ceiling fans and heat for cooler days. Open Air Gondolas are created from retired baggage and flatbed cars, with long padded outward-facing seats for the panoramic views. In Crown Class, relax in restored coaches dating from 1925, with larger windows for better viewing and climate control. Get a souvenir tumbler to fill with a fountain soda. The First-Class riding experience is one-of-a-kind! Travel in comfort and style in 1940s-era bar, lounge and dinner cars. Have lunch served by the car’s private attendant, and receive a souvenir tumbler with fountain soda and an embroidered tote bag gift. First-class cars are climate-controlled and full bar service is available. Click here to visit their website for current pricing, packages and specials. May-October: Carolina Shine Moonshine Experience - Hop on board the all-adult first-class Moonshine Car serving the handcrafted, triple-distilled Midnight Moon. 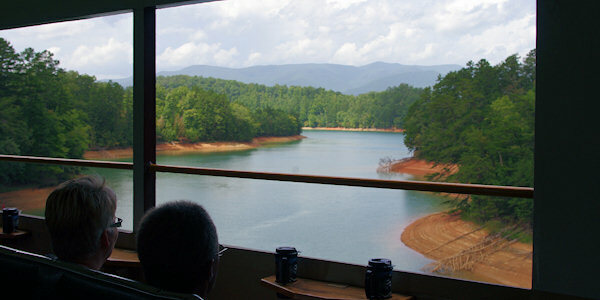 Operating on the Nantahala Gorge excursion, a full-service ride with a private attendant serving BBQ, cornbread and Moonshiners Mud Chocolate Pie. Go to their Website for more. May-October: Rafting Packages include a one way trip to Nantahala Outoor Center with a guided whitewater rafting trip back. Fontana Trestle Train BBQ & Brews - Back for limited dates, featuring slow-cooked BBQ prepared fresh and beer tastings showcasing local breweries. $70-$82/person. March 16, May 25, June 14, July 19, August 24, Sept 14. Go to their website. April 19 & 20: Peanuts Easter Beagle Express - Join Snoopy, Lucy, Charlie Brown and the Easter Bunnies for plenty of fun on a 4-hour trip, with a 1.5-hour layover in Dillsboro for activities. From $29/child, $51/adult. July 4: Freedom Train - Celebrate Independence Day with this July 4th train ride. This special trip will depart from the Bryson City Depot at 7 PM, following the Nantahala Gorge Excursion route to the Fontana Trestle. 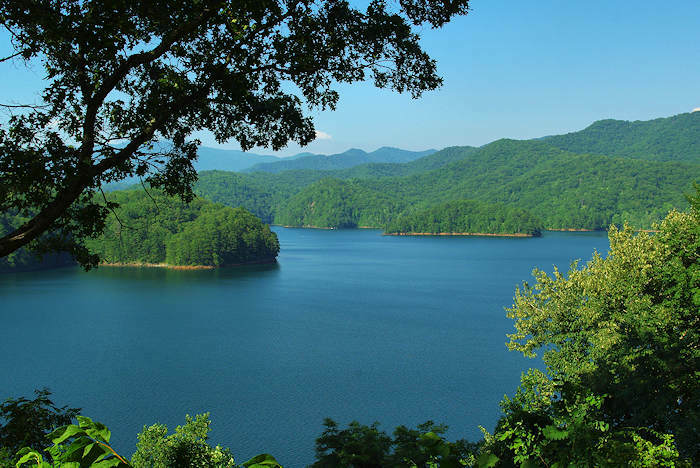 Once at the trestle, pause for some spectacular viewing and then head back to Bryson City to rejoin the big Freedom Fest for an awesome fireworks show in the downtown area! Crown and coach seating enjoys a BBQ meal and apple pie. October 4-27: Peanuts Pumpkin Patch Express - Join Snoopy, Lucy, Charlie Brown in search of the Great Pumpkin on a 4-hour trip, with a 1.5-hour layover in Dillsboro for activities. Friday-Sunday. November 8-December 31: Polar Express Train - Journey through the quiet wilderness to the North Pole. Set to the sounds of the motion picture soundtrack, enjoy warm cocoa and a treat while listening to the magical story. It's very popular, so get advance tickets. See pics & read much more! Note: The Wizard of Oz Train will not return in 2018. For more special trips, visit their website for current pricing, packages and specials. Be sure to see their Smoky Mountain Trains Museum (included with your ticket) with its collection of 7,000 Lionel engines, cars and accessories, and impressive operating layout. Directions: Located in downtown Bryson City (45 Mitchell Street), about 65 miles west of Asheville. From Asheville, drive I-40 West to exit 27. Take US 74 for 40 miles to Exit 67 for Bryson City. At the end of the exit ramp, bear right. At the first light, turn right onto Main Street, then left onto Everett Street. At the first traffic light on Everett, turn left onto Mitchell Street for the railroad parking. Street address for GPS: use 45 Mitchell St, Bryson City, NC for parking area.